106: "updating to rev %d because of new feature flag, "
437: printk(KERN_ERR "schedule_timeout: wrong timeout "
Basically you can add attributes to any kind of data type. 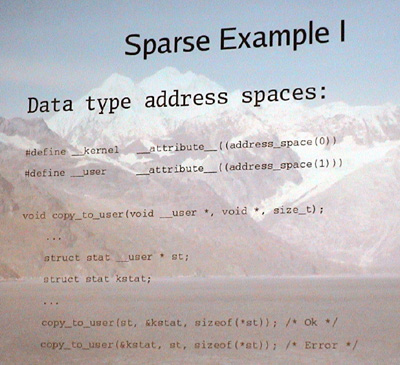 In Sparse one of the attributes on data types is which address space it belongs to. This is a define that goes away if you don't use Sparse. Make context count warning be controllable with "-Wcontext" flag. 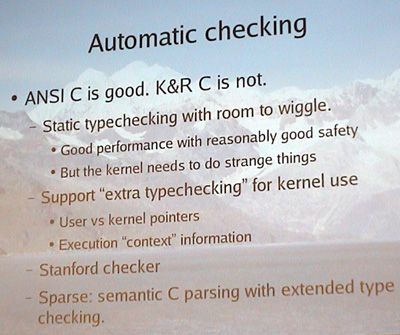 Next message: OGAWA Hirofumi: "Re: [2.6 patch] kill fatfs_syms.c"
Previous message: Andi Kleen: "Re: [PATCH] Add panic blinking to 2.6"
Next in thread: Roland Dreier: "Re: Sparse "context" checking.."
In particular, this is designed for doing things like matching up a "lock"
spinunlock count as "-1", and then hopefully it should all add up. frowned upon, and there aren't that many cases where it happens. I haven't done the annotation for any functions yet, so expect warnings. it to, while "r_stop" released a lock that sparse hadn't realized it had. sparse just doesn't understand that. and another releases it, and they just haven't been annotated as such). Linus> count as "-1", and then hopefully it should all add up. notice in the current tree you just didn't annotate spin_trylock(). > Linus> count as "-1", and then hopefully it should all add up. > notice in the current tree you just didn't annotate spin_trylock(). ie we add a "+1" context marker for the success case.